The UN Palestinian refugee body (UNRWA) is under the complete control of Gaza-based terror groups Hamas and Islamic Jihad, a Center For Near East Policy Research report concluded. The Center For Near East Policy Research documented how the controlling union of UNRWA is led by Hamas jihadi Suheil Al Hindi. It also noted that eleven of fourteen positions in the UNRWA teachers’ union have been filled by Hamas members. 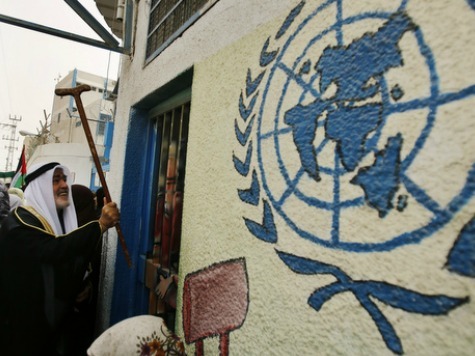 “Hamas’ takeover of the UNRWA institutions and UNRWA staff should set off alarms regarding the possibility of funding given by donor countries – primarily the United States – finding its way to financing the salaries of Hamas and Islamic Jihad activists,” the report concluded. During Israel’s recent war against Hamas, known as Operation Protective Edge, on three separate occasions rocket arsenals were found at UNRWA schools in Gaza. On another occasion, three Israeli soldiers lost their lives after a booby-trapped UNRWA building detonated while they were inside of the structure. UNRWA has in the past been accused of hiring terrorists as employees and using its ambulances as cover to aid Hamas’s terror operations. Videos such as Camp Jihad have exposed the radicalism in standard UNRWA schools – which preach salafi jihadist ideologies along with plenty of anti-semitic sentiments – to unassuming grade-school aged children. Following Israel’s 1948 war of independence against Arab aggression, UNRWA was formed to provide relief and public works programs for displaced Arabs who lived in the former British mandate of Palestine.